➔Continue reading "We’re hiring additional Narrative Designers. Join us!" The application phase ends on 25th of June 2018. ➔Continue reading "Join the Epic Story! We reinforce our Narrative Team"
All Around The World, a France-based company, is looking for another Narrative Designer to join our game’s creative team. This is a part-time, remote contract position. Tau Station is a text-based science fiction MMORPG currently in development. We’re merging elements of choice-based interactive fiction with all the functions of a traditional MMO – trading, missions, crafting, combat, politics, skills, and more – and building something new. Our vision for Tau Station is to create a fully immersive, engaging game world that rests on the foundation of a quality science fiction plot. ➔Continue reading "Love Sci-fi? 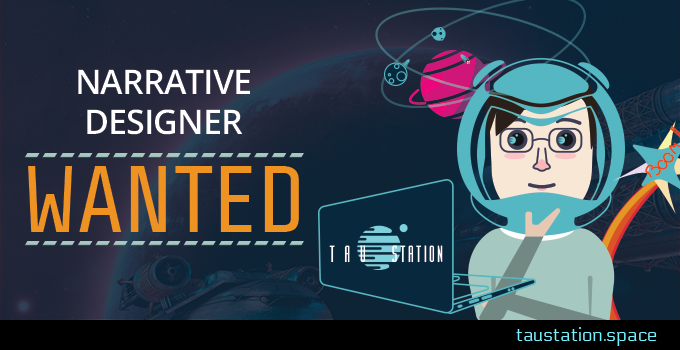 Tau Station is Hiring for a Narrative Designer"